If you answered, “Matt, surely it’s an international criminal ring dedicated to evil and fought against by MI5 and James Bond”, well done, you’re almost correct. Go and do a Google Image search for “SCOBY”, and then, if you’re not convinced that the evil criminal masterminds have already won, read on. I’m writing this while sitting at our dining-room table. 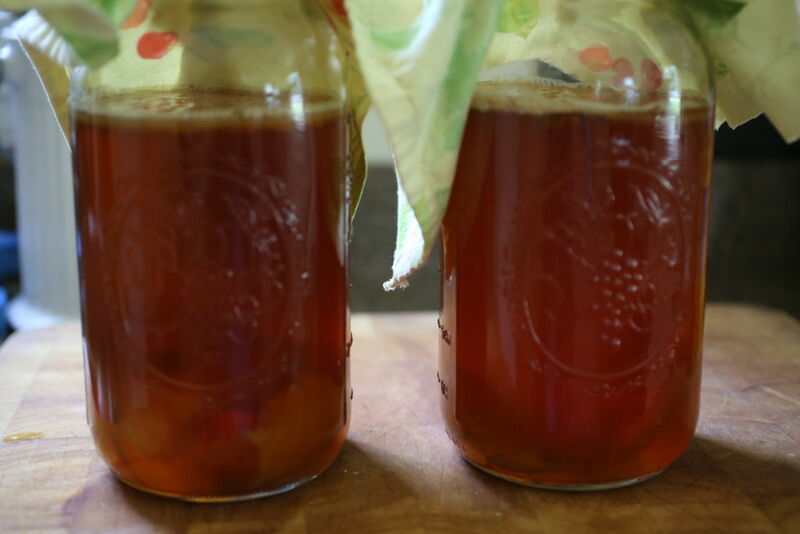 At one end are two jars, filled with a light brown liquid, with slices of mold at the top and bottom: that’s kombucha. At the other, another jar filled with string beans, dill and garlic – “dilly beans”. All the jars are covered with pieces of old dishcloth tied with string. I can smell them both quite distinctly. The beans have an earthy, herby smell, faintly sweet. The kombucha is more yeasty, like fresh, live dough or home-made wine. This experiment in bringing live bacteria into the house and actively encouraging them to grow was put in place last weekend, by a fermentation class we attended at Common Ground Farm. Jess Simkovic, who led the class, gave us the basic run-down of what we mean by fermentation and how we can make use of this natural process to make various foods and drinks. Beer, wine, bread, cheese and yogurt are all fermentation products, as are acid-soured foods like pickled cucumbers. The advantage of fermenting at home is that the bacteria – many of them beneficial to digestion and immune response – are kept live and active. This does mean that you have to exercise care in handling them (you don’t want to transfer bad bacteria to the batches and contaminate them), but essentially, provided you prepare it all correctly and are sensible about hygiene, it’s really a case of set it up, leave it at room temperature in the shade, and don’t mess with it too much. Both should be ready to sample in a few days. I’ll report back once we’ve tasted them – if you’ll excuse me now, I have to go put on a hazmat suit and open up the car.